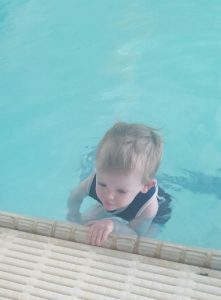 Babies love swimming, especially 2-year-old Bobby Richards! Babies have a real affinity with water, and because they’ve spent 9 months floating in the womb, being in warm water feels much more familiar to them than being on dry land. However, this early confidence usually diminishes with time, and can even turn to fear. 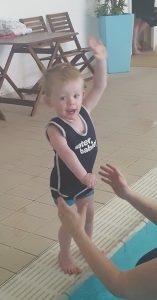 That’s one of the main reasons why Water Babies believe in starting them, which is exactly what Ceri Richards from Chester did with her baby Bobby at just 12 months old. All babies learn through repetitive teaching, word association, play and regular classes. In their first few weeks, babies naturally make rhythmical, co-ordinated swimming movements, and also inhibit their own breathing underwater (something called the gag reflex). After about 6 months, that reflex lessens as they start to take control of their own breathing when going underwater. Until they’re aged about 3, babies and toddlers lack the strength, co-ordination and motor skills to swim on the surface; the way their body-mass is distributed also makes it difficult. However, with careful supervision and encouragement they can naturally swim short distances underwater from very early on. Water Babies structure their programme to reflect children’s natural development phases; for example, the fully supported swim position little ones start in progresses as they develop their motor skills, strength and stamina to become independent swimmers with controlled arm and leg movements, eventually turning into front paddle and later, front crawl. Each Water Babies office has easy access to central resources covering a wide range of disabilities and difficulties, but they also want to talk to you about how they can best help you or your little one. They will teach the standard course and adapt it by taking into account your particular needs. Their swim programmes uses building blocks which start with simple skills and then expand on them as the weeks progress. And although their classes are full of energy, they take great care to teach at the pace that works best for you. 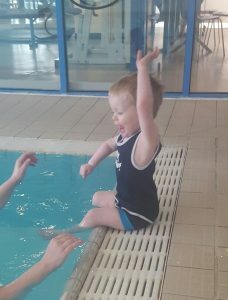 Although Water Babies do have access to a medical group which includes a GP, physiotherapists and a neurological surgeon, they don’t presume to be medical or therapeutic experts. Therefore, they would always ask you to first check out the suitability of swimming sessions with your child’s health professionals. Once you’ve talked to your health professionals, do have a good chat with Water Babies Chester, Wirral and North Wales on 01244 641989 about any queries you might have. They fully appreciate that you’ll want to feel 100% confident about every aspect of their classes before you enrol your child, and they’ll work closely with you to provide information and to address your concerns.